In a double blind, randomized, controlled study, 150 outpatients with IBS took an Enzyme Linked Immunosorbent Assay (ELISA) test to detect the presence of IgG antibodies to a panel of different food antigens. The patients were then randomly assigned either a “true” diet or a “sham” diet. The “true” diet excluded the foods that revealed elevated levels of IgG antibodies while the “sham” diet excluded an equal number of foods but did not raise any IgG levels. The goal of this study was to investigate the effect diet restriction based on IgG antibodies had in relation to migraine effects and severity. Following this 6-week period, patients went through a 2-week diet-free period. After that buffer period, patients were then given the opposite 6- week diet than the one they received previously. A “statistically significant reduction in the number of headache days and number of migraine attacks” was found in the period patients eliminated raised IgG level reactive foods. 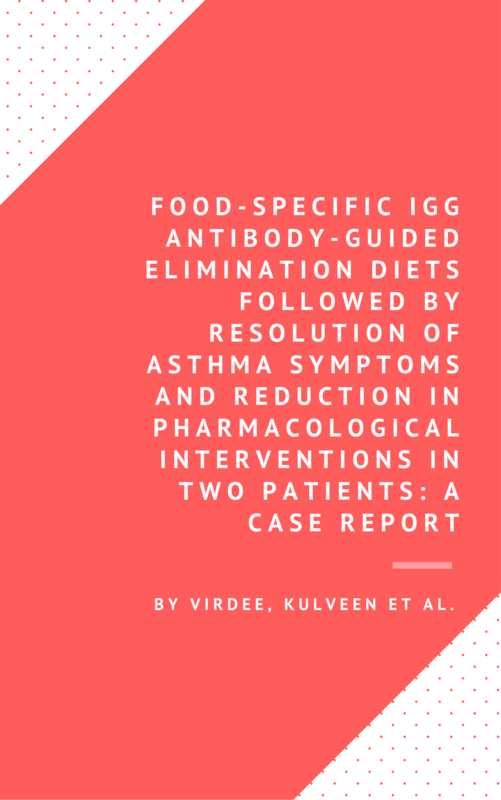 This case report monitors the symptomatic changes of 2 patients with asthma (Patient A and Patient B) after utilizing an ELISA IgG antibody assessment and recommending “complete avoidance” of potential food intolerances. “Based on the presented cases, in patients with poorly controlled asthma, physicians may consider routinely testing and screening patients for the presence of IgG food antibodies. 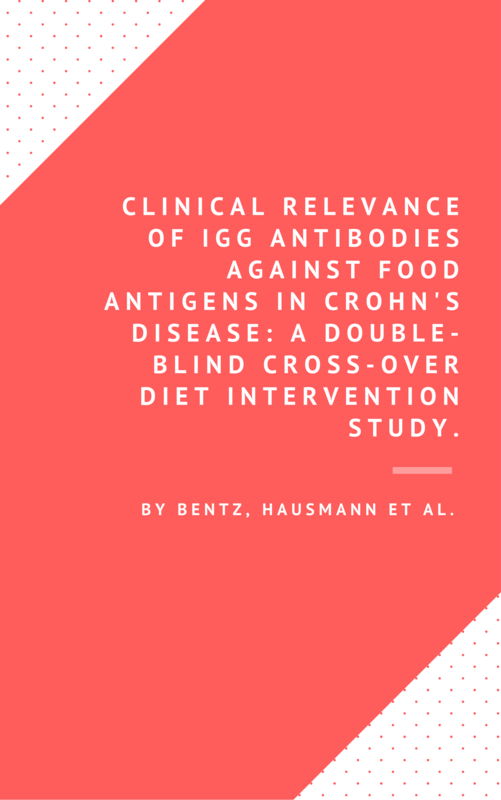 This study sought to identify whether Crohn’s Disease patients had higher immune responses against “auto-antigens” or “food-antigens” that perpetuated inflammation compared to healthy patients. “Based on the IgG antibodies” found via an ELISA test, a nutritional intervention was planned and patients were then instructed to follow either a “specific” (true) or “sham” (false) diet. 30 obese juveniles and 30 normal weight children were observed for this study. This study presents “that obese children have significantly higher IgG antibody values directed against food antigens than normal weight children. Anti-food IgG antibodies were found to be tightly associated with low grade systemic inflammation and with the IMT (Intima Media Thickness) of common carotid arteries in obese and normal weight juveniles. These findings raise the possibility that anti-food IgG is pathogenetically involved in the development of obesity and atherosclerosis. 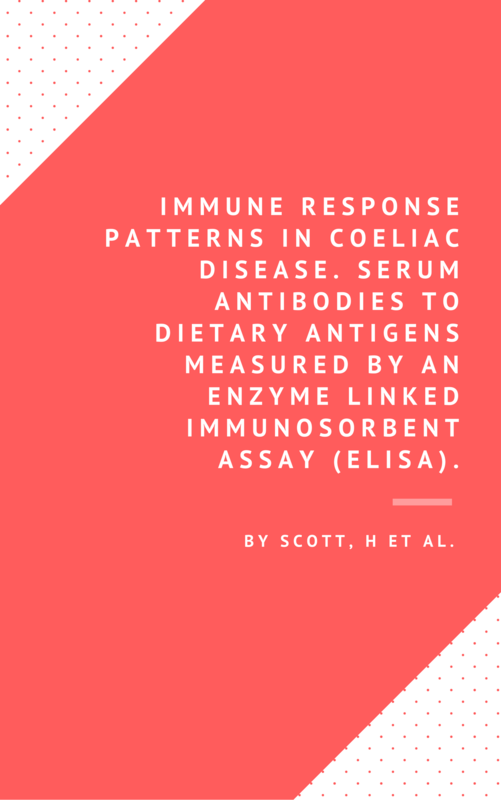 Adults and children with untreated CD showed similar serum activities to glyc-gli and gluten, which for both groups were increased in the IgG and IgA classes compared with healthy controls. An ELISA method assessment was performed to detect “specific antibody IgG in 14 kinds of food” to healthy subjects and allergy dermatosis patients alike. The statistical analysis showed that there was a significant correlation between high IgM ELISA titers and low avidity of IgG.